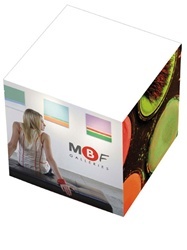 Bic Custom Non-Adhesive Imprinted Paper Cube is made from paper. Personalized Imprinted Paper features different artwork on 4 sides. Bic Custom Non-Adhesive Imprinted Paper Cube is available with drilled holes for pen (optional).